1. Thanksgiving is a holiday that many people simultaneously love and dread. 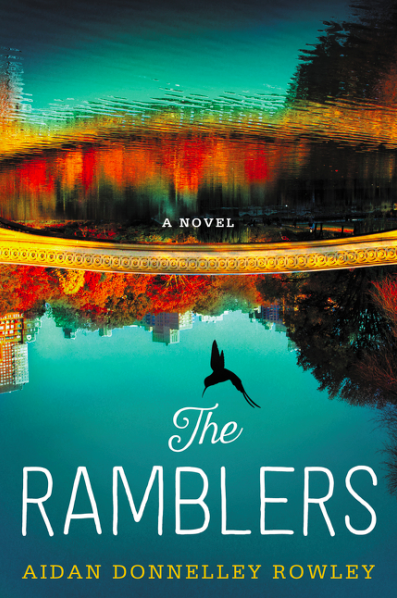 The author purposefully set The Ramblers during the week leading up to Thanksgiving. Why do you think she chose this particular time of year? How to you think the looming holiday might be affecting her characters? 2. Clio Marsh studies birds, creatures with the unique ability to fly away at a moment’s notice. Clio herself suffers from anxiety, which also drives her to “fly away.” How does Clio’s choice of career reflect the issues she faces in her life? And, given her subconscious quest for impermanence, is it a surprise she chooses to fall in love with a man who lives in a hotel rather than a “real home”? 3. At first, Clio can’t bring herself to tell Henry the truth about her mother’s mental illness and death, implying she died of cancer, not a suicide. Does this inability to tell the truth echo an inability to face the truth about her mother? Is she hiding the facts not solely from Henry, but also from herself? 4. In college, Clio often felt as if she didn’t quite fit in. Tate and, especially, Smith, seemed like the ultimate insiders. But was this truly the case? 5. Smith helps others organize and clean out the clutter in their lives, but Smith’s life is actually kind of a mess. Describe what you see as Smith’s greatest “excess baggage.” And how is her relationship with her family the cause of this mess? Or is it? 6. Smith’s father says: “We didn’t send you to Yale to become a housekeeper.” How does her father’s perpetual perceived disdain inform Smith’s current life choices? Do you think it was rebellion that propelled her relationship with Asad? Do you think Asad was ever truly as invested in Smith as she was in him? 7. In many families there is the “perfect” child—here Sally—and the “let-down,” here Smith. Do you think that this is truly the case in Smith’s family? Or is this only Smith’s point of view? Do you sense Thatcher and Bitsy may have been as hard on Sally—creating her perfection—as they were on Smith—creating her sense of imperfection? 8. Sister relationships are always complicated, and often sisters can hurt each other in ways friends do not. Here, Sally hides the truth from Smith about Asad’s impending fatherhood. Do you feel she was right to do so? In what ways, if any, does Sally act guilty for getting her sister and Asad together in the first place? And how has Smith hurt Sally, either purposefully or inadvertently? 9. Tate proposes to his soon-to-be ex-wife, Olivia, on 9/12/11, the day after “9/11.” Olivia is described as constantly seeking happiness. Was his proposal—and her acceptance— an effort on both of their parts to find happiness in an otherwise chaotic world? Do you think they would have gotten married if not for the events of that day? 10. Why haven’t Clio and her father ever truly discussed Eloise? What pushes them to finally face her memory? In what ways was Eloise magical to both of them and in what ways was she unintentionally destructive? Eloise had Bipolar Disorder, which is often misunderstood or misdiagnosed. What, if anything, could Clio or her father have done to “save” Eloise? 11. How do you think Bitsy and Thatcher ever got together to begin with? Do you think Smith knows her father broke up her romance with Asad? If so, how can a person forgive someone who acts so unforgivably? 12. Clio’s mother, Eloise, was obsessed with Charles Darwin and the concept of natural selection (among other things about him). Is it possible that this is the first time in their lives all three main characters—Clio, Smith, and Tate—have been forced from the safety of their nests? In what ways are they all like the little bird Clio and Henry encounter at the novel’s end?